The summer is coming to an end, but that does not mean that our sale is over. On this last day of the summer season, we are ready with our warehouse clearance. 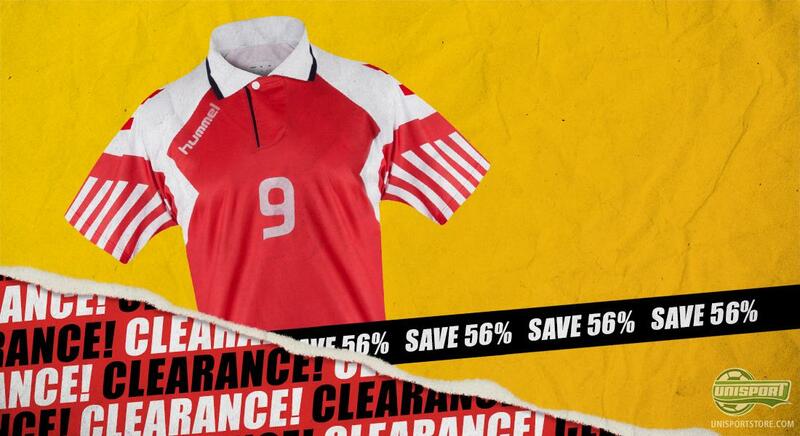 We have dropped the prices drastically on everything from national team shirts to football boots. Have a look at the great offers right here and maybe you will find just what you are looking for at a bargain. We are welcoming the autumn with fantastic prices on a long range of great products. Prepare yourself for the autumn season with a brand new pair of football boots, a set of shin pads, a new football shirt or maybe something completely different. The clearance is on, and our prices are lowered even further. Feel free to look through our great selection of reduced products and see if you can find something you like. 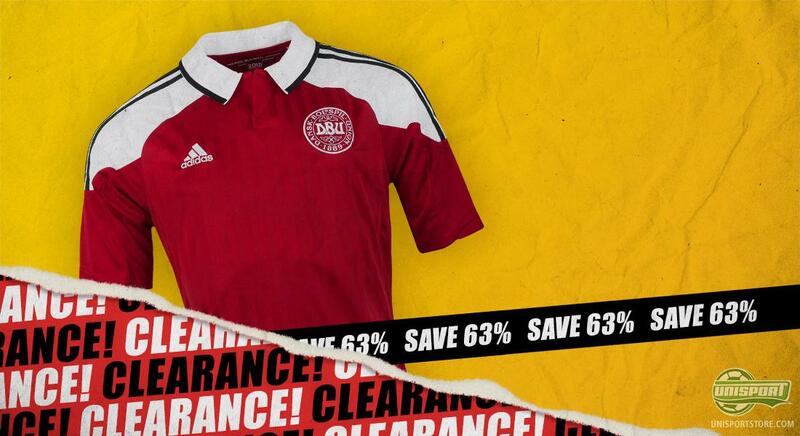 Get ready for the forthcoming friendly national matches with a Danish national team shirt 12/13 from Adidas for just £26 - thus saving no less than 63%. You can also look bakc at the EURO 1992 where Denmark took the gold. 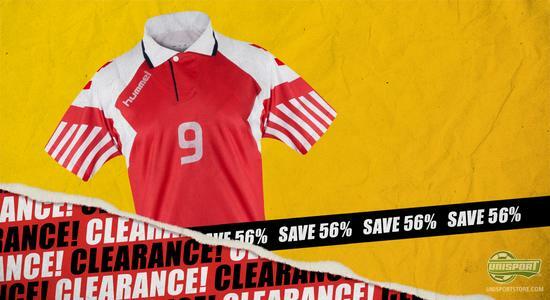 Reminisce with a retro Hummel national shirt from 1992, for just 17 - you are saving 56%. You can also prepare yourself for the more chilled autumn season with some training wear. For example you can get this classic DBU Windbreaker, for only 19 - you are saving an impressive 70%. 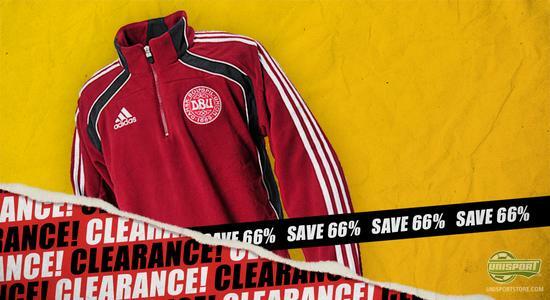 For the really cold days you may want a DBU Fleecejacket for the chilly training sessions, and you can get it for just 26 - thus saving 66%. 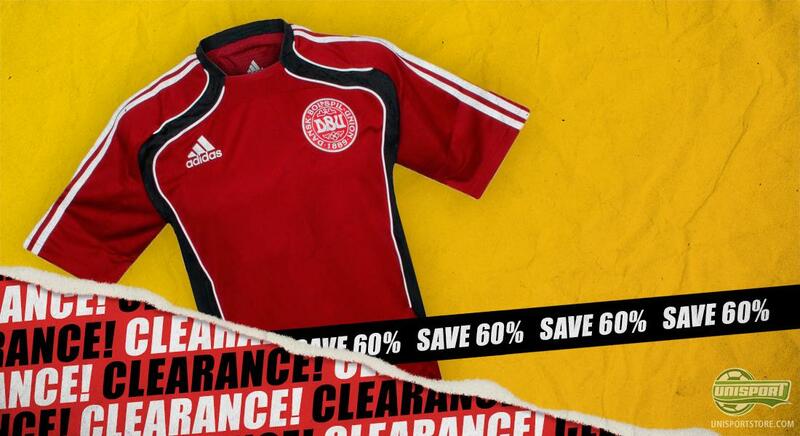 You can also go for a true bargain on some of the most popular national team shirts of the summer. 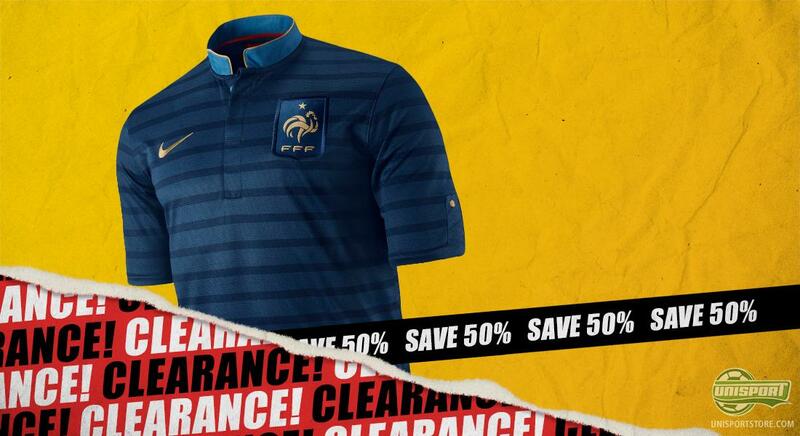 This might be the France home shirt 12/13 from Nike, it can be yours for only 39 - saving 50%. Or you might want a classy England home shirt 12/13 from Umbro at the same great price of 39 - saving 50% also. 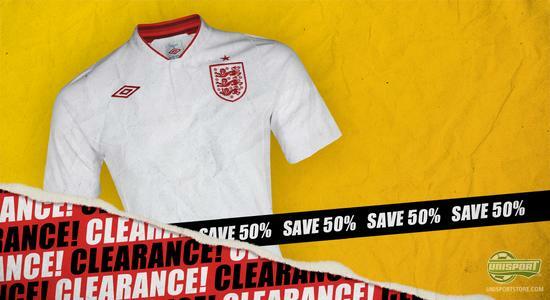 Now is the time to strike, if you want, what could be, the last Umbro England shirt. We have, of course, also included football shoes in the sale, and the prices are just as incredible. 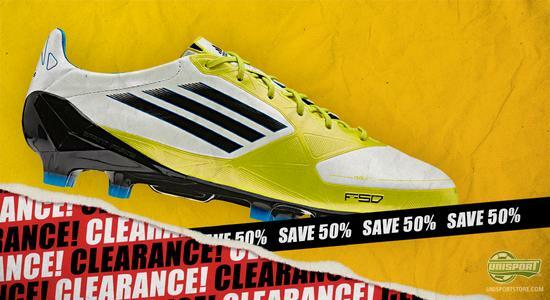 For example, you can get yourself a pair of 'Messi' boots, that is the great Adidas F50 Adizero White/Lime/Black at half price, which is only 126 - you are saving 50%. Hurry up and check out our Clearance campaign site where you will find a long range of really great offers. Boots, tracksuits and national shirts are just a fraction of of what we can offer, surely there must be something for you as well. Autumn is upon us, and we have knocked down our prices even further. Do you like our great offers? Did you find anything you had to get?